The thirteenth century saw a blossoming of religious literature aimed at the laity composed in the vernacular as well as in Latin for the preachers who ministered to them. It has been traditional in literary history to attribute this vernacular creativity to the Fourth Lateran Council. Although the Council was part of a longer tradition of Church reform, it nonetheless crystallized theological and ecclesiastical thought in a form that was a spur to composition by writers and preachers for more than a century. The aim of this volume is not to attempt a comprehensive account of the Council or its reach in religious writing of the period but to further our understanding of how lay people, largely neglected by earlier councils, received Lateran IV’s doctrinal definitions and disciplinary rules. The essays gathered here concentrate on England, where bishops enacted the Council’s reforms with particular enthusiasm, and France, where the earliest instructional literature appeared. 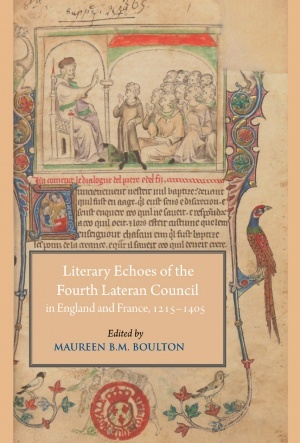 While the volume takes into account individual works that may have responded more directly to the decrees of the local bishops who enacted the canons proclaimed in 1215, it focuses on others in which the imperatives of the Fourth Lateran Council reverberate as literary echoes, revealing remarkable and often surprising connections with the larger historical and religious context. The texts discussed span the many languages of England and France of the period: Latin, Anglo-Norman, Middle English, Old French, and Occitan. The interpretation of literature that undergirds the entire collection is suitably broad, ranging from chanson de geste and Chaucer’s Canterbury Tales to didactic works, and encompassing along the way both biblical translations and sermons whose use of literary techniques to engage their audiences makes them “literary,” even if not always fictional. Maureen B.M. Boulton is Professor emerita of French at the University of Notre Dame and, since 2017, a Visiting Fellow at the Pontifical Institute of Mediaeval Studies. Her interests in medieval French literature, including that of England, have ranged from the relationship between lyric poetry and narrative to religious literature, especially the lives of Christ and his mother. The author of The Song in the Story: Lyric Insertions in French Narrative Fiction, 1200–1400 (1993), her most recent books are Piety and Persecution in the French Texts of England (2013) and Sacred Fictions of Medieval France: Narrative Theology in the Lives of Christ and the Virgin, 1150–1500 (2015). She was Ruth J. Dean’s junior collaborator on Anglo-Norman Literature: A Guide to Texts and Manuscripts (1999).